As a romance writer you know love is messy, as a matter of fact, the messier you make it the better the story is, so for today's walking tour in Chicago I'm going to take you somewhere messy, but easy to clean up. “Do you smell that? It smells delicious?” That's what I heard two women on the street say to each other. And it’s true you will catch the scent of popcorn in the air before you ever enter a Garrett’s popcorn location. Garrett’s popcorn opened in 1949 at 10 West Madison in downtown Chicago and there has been a line outside their doors ever since. 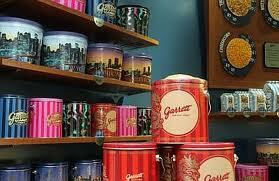 Garrett’s is Chicago’s premiere popcorn emporium. The blend of CaramelCrisp and CheeseCorn, known as the Chicago blend, has been a staple Chi Town favorite snack, combining of the sweet/salty experience since childhood. They hot-air pop the blend of kernels and mix the fluffy puffs with the secret family toppings recipe in handmade copper kettles daily. They don’t use fat or oil to make the popcorn so the taste is impeccable, but be forewarned the CheeseCorn is finger licking good. This is where the “love is messy” printed on their napkins comes into play. The popcorn is packaged in wax bags or brightly colored tins. Garrett’s is right around the corner from the old Marshall Field’s store and during the holidays you will see children and adults alike, munching on these fabulous morsels while checking out the famous Christmas window display. If you come to Chicago this is a must have experience. 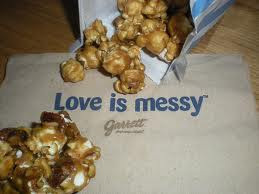 Garrett mail-orders all its products and you can shop online here: http://www.garrettpopcorn.com/. But it’s special fun to stop in the store, while you wait in line on the sidewalk to place your order, you watch the corn being popped, the butter being poured, and the CaramelCrisp stirred so it sticks together just enough not clump. Not only is Garrett’s a Chicago tradition it’s one of Oprah’s favorite things. Come visit this Chicago landmark and see if you can walk away from the inviting popcorn aroma. I can't, I followed the ladies in and had a 'love is messy' bag or two. Oh the memories! We used to get those big tins with the three flavors every Christmas. I always liked the cheese corn best. Me too! Well is used to be my favorite now I like the blend of the two. Where I grew up in the city our local movie theatre, The Tiffin, used to sell this popcorn freshly made at the concession stand. Take care and happy summer solstice.